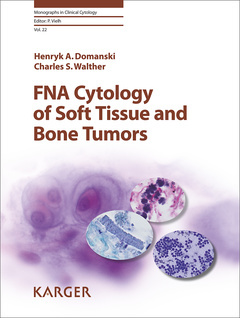 FNA Cytology of Soft Tissue and Bone Tumors Domanski H.A., Walther C.S. Auteurs : Domanski H.A., Walther C.S. Directeur de Collection : Vielh P.
Fine-needle aspiration cytology (FNAC) has been commonly used to follow up on previously treated sarcomas or to confirm soft tissue and bone metastases of carcinomas, melanomas or lymphomas. Its role as the first-line approach in the diagnosis of primary soft tissue and bone tumors has increased due to progress of less invasive diagnostic procedures and the growing availability of diagnostic ancillary tests. This comprehensive and richly-illustrated volume presents cytomorphology of all common neoplastic soft tissue and bone lesions but also of rare tumors largely described in case reports. Key points for cytological features, differential diagnosis, and the use of ancillary tests are discussed and illustrated in order to facilitate the diagnostic work-up in FNA samples. The volume is organized on the basis of the most recent WHO classification used in surgical pathology in order to provide a practical guide for modern cytologic diagnosis of surgical soft tissue and bone pathology. It is aimed mainly at surgical pathologists and cytopathologists, but also at orthopedic surgeons and clinical oncologists.